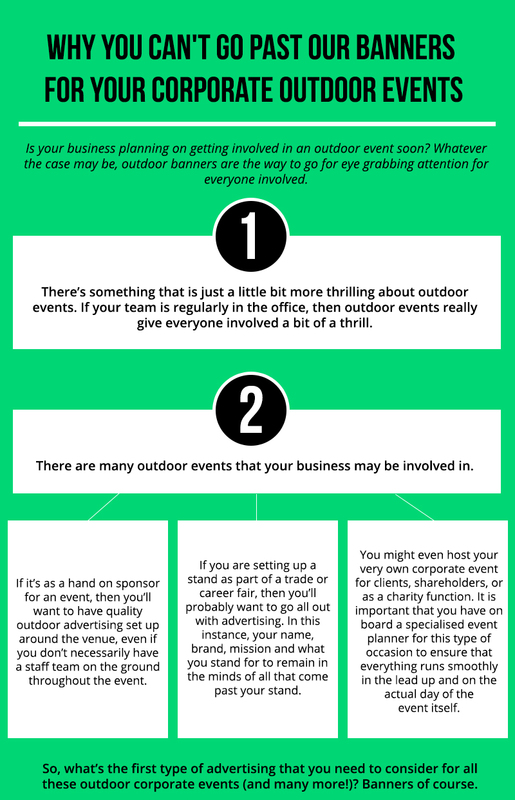 Is your business planning on getting involved in an outdoor event soon? Maybe you’re just looking to refresh your ongoing advertising material for events that you attend on a yearly basis? Whatever the case may be, outdoor banners are the way to go for eye grabbing attention for everyone involved. There’s something that is just a little bit more thrilling about outdoor events. If your team is regularly in the office, then outdoor events really give everyone involved a bit of a thrill. The elevated mood in the air is thick, and everyone is really excited to be out and about. There are many outdoor events that your business may be involved in. If it’s as a hands on sponsor for an event, then you’ll want to have quality outdoor advertising set up around the venue, even if you don’t necessarily have a staff team on the ground throughout the event. If you are setting up a stand as part of a trade or careers fair, then you’ll probably want to go all out with advertising. After all, in this instance you want your name, brand, mission, and what you stand for to remain in the minds of all that come past your stand. You might even host your very own corporate event, for clients, shareholders, or as a charity function. If this is the case, then the fit out of the venue will take a lot of careful preparation and planning, stretching out months in advance of the event itself. It is important that you have on board a specialised event planner for this type of occasion to ensure that everything runs smoothly in the lead up and on the actual day of the event itself. So, what’s the first type of advertising that you need to consider for all these outdoor corporate events (and many more!)? Our banners of course. We have a range of outdoor portable banners and banner stands that are built tough to hold up in the outdoors in all sorts of weather. Our outdoor banners come in a range of different sizes and shapes so you can choose what you think is going to suit your business branding and the surrounds the best. We have high quality printing so that your branding will stand out and the banners won’t fade in the weather. Have a browse through our outdoor range to see what we have available and how it would suit you. We also have a marquee setup available for customers seeking a stand for outdoor events that is decked out with advertising materials. Contact us for any enquiries that you have or to start ordering your new outdoor banners for your corporate events.